School Improvement is a continuous process used to ensure that all students are achieving at high levels. Each year, schools and districts review policies and practices to consider ways to improve and enhance student achievement, teaching and learning. This process, commonly referred to as the school improvement process, is deeply embedded in building and district planning. This is a collaborative process through which staff and stakeholders identify strengths and weaknesses of the entire school operation and use that information as a basis for making informed decisions for all kids. The process requires that schools and districts develop 3-5 year School Improvement plans, report on the progress of those plans yearly and do a yearly assessment of progress on meeting standards of excellence. 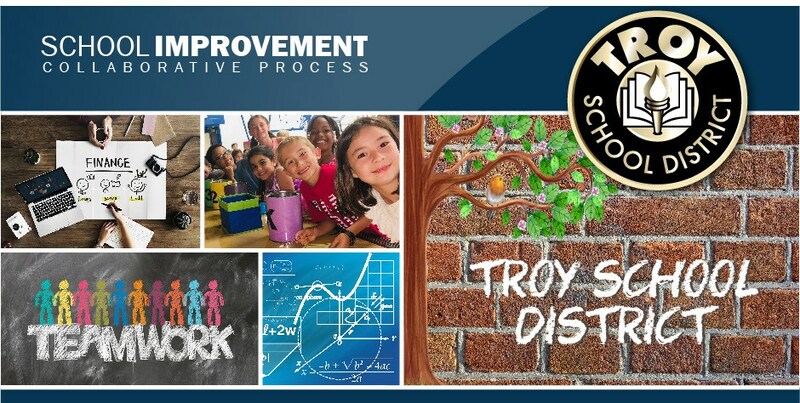 The Troy School District has been awarded District wide Accreditation from AdvancED (formerly North Central Association). Schools and districts benefit from accreditation through objective peer review, attainment of high standards, and engagement in continuous improvement. To earn accreditation, schools or districts meet the AdvancED standards, engage in continuous improvement, and demonstrate quality assurance through internal and external review. The standards are based in the research on the factors that impact student achievement. The accreditation process helps schools and districts bring together all the parts of the school or district to improve student and organizational performance.